Hatch Yoga is an amazing yoga studio. The wealth of knowledge I have learned has given me the confidence to further my own yoga practice and to begin teaching others. It has been a truly incredible and amazing experience, I learned so much more than i expected. Both Sabina and Kiran are amazing knowledgeable teachers and have powerful teaching skills, guiding and ensuring us not only understanding and also know how to use techniques to achieve teaching objectives. I am so happy with my Yoga Teacher Training experience at Hatch Yoga! When I started the program, I had a decent physical practice, but not much else with regards to philosophy knowledge or meditation experience. The course began with Sabina teaching us anatomy and Kiran teaching philosophy. From the very first weekend, I knew this was going to be an amazing education. Kiran is so knowledgeable about yoga history, philosophy and ethics. She captured all of our attention every lecture with great visuals, key concept summaries and relevant narratives. She also led meditations throughout the course, encouraging us to try different techniques and strengthen our own personal meditation practices. Sabina’s passion for anatomy greatly enhanced the course as well, enabling us to understand key alignment concepts and pose biomechanics. I thoroughly enjoyed and appreciated how she would break down poses to help us not only learn cuing, but to also create more body awareness in ourselves. In the later section of the course, we learned more about creating sequences and classes ranging from Hatha and Vinyasa to Restorative and Yin. She gave us countless opportunities to create and sequence our own classes. Finally, the numerous hands-on teaching opportunities, throughout the course, were invaluable. Teaching to other yoga teachers in the class, as well as charity classes, provided me with the confidence I need to sequence and lead my own classes. 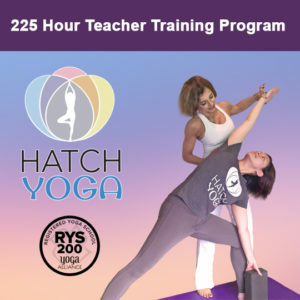 I highly recommend Hatch Yoga YTT for any teacher looking for an alignment and anatomy focused education, with an excellent focus on pre-modern yoga philosophy. Sabina and Kiran dedicate their time to ensuring you understand what they are teaching you. They are encouraging and supportive and really care that you are learning about yoga and how to teach it. Sabina and Kiran are excellent teachers; they helped me understand not only the theoretical principles of Yoga, but also body alignment, breathing techniques, detailed cueing throughout poses, anatomy with lots of opportunities to teach and receive valuable feedback. Also taught was how to meet an individual students need with modifications. Meditation and observing mental activity was also covered. The Hatch Yoga Teacher Training (YTT) was a transformational experience. I had practised yoga for years before the YTT but little did I know how this journey would take my physical, mental and spiritual practise to a whole new level, as well give me the confidence to help and teach others. The spirit and energy of the teachers are what make the Hatch YTT such an exceptional place to learn. Kiran teaches the history and philosophy of yoga and is engaging and entertaining which made learning the material enjoyable. Sabina teaches anatomy and the core teacher training and is exactly what great mentors are made of: passionate, knowledgeable, encouraging and tough but genuinely cares for her student’s success. It was an intense and challenging 5 months, but what a profound impact it has had on my life. If you are thinking of becoming a yoga teacher there is no doubt that this is the place to go, because you will come out with much, much more. I graduated from the Yoga Teacher Training program at Hatch Yoga studio in July 2018. Completing this training program has been one of the most rewarding accomplishments of my life. The studio owner, Sabina Erlich is incredibly passionate about teaching and inspired me to be my best throughout the program. I feel very confident stepping into the world of teaching Yoga because the learning was so in depth and truly helped me understand the anatomical concepts behind Yoga. Kiran Sohal who taught the philosophy of Yoga during this program is a true story teller and made the journey so enjoyable that I wanted to stay longer talking to her after every class. I will forever cherish this experience and cannot thank these ladies enough for providing such an exceptional platform for a fantastic and truly in-depth Yoga teacher training program! Sabina is an amazing teacher! I was very picky about where to enroll in YTT, but Im very happy I decided on Hatch Yoga. The training Sabina provides is excellent on a technical level, and her encouragement and support was above and beyond what I expected. Equally amazing was the yoga phylosophy taught by Kiran who hooks you with her vast knowledge and teaching method, which made learning a joy. But what separates Hatch Yoga Teacher Training from the rest is sabina’s pasion for teaching yoga. She pours her heart into YTT. She is really though, but genuinely cares that you do well so that you can become the best yoga teacher posible and ready to teach. This was well worth the money! Hatch Yoga teachers are very pasionate about what they teach. If you want to become a Yoga Teacher and learn more about the history of Yoga this is the place to learn.